DOES ARBITRATION APPLY TO CONTEMPORANEOUSLY EXECUTED CONTRACTS (WHEN ONE OF THE CONTRACTS DOES NOT HAVE AN ARBITRATION PROVISION)? Binding arbitration is an alternative to litigation. 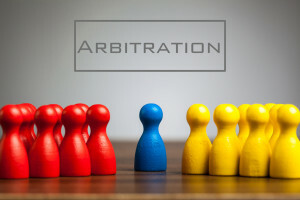 Instead of having your dispute decided by a judge and/or jury, it is decided by an arbitrator through an arbitration process. Arbitration, however, is a creature of contract, meaning there needs to be a contractual arbitration provision requiring the parties to arbitrate, and not litigate, their dispute. Just like litigation, there are pros and cons to the arbitration process, oftentimes dictated by the specific facts and legal issues in the case. What happens when a person executes two (or more) contemporaneous contracts, one with an arbitration provision and one without? Are the parties required to arbitrate the dispute arising out of the contract that does not contain the arbitration provision? The reality is that this has become an unnecessary over-complicated situation that should be avoided by specifically incorporating all of the contracts into an operative contract or, conversely, expressing the intent in each contract whether arbitration applies. Being specific will avoid the over-compilation of this issue. In an example of what really amounts to an over-complicated opinion regarding an arbitration provision, the case of Lowe v. Nissan of Brandon, Inc., 43 Fla. L. Weekly D103b (Fla. 2d DCA 2017) dealt with a consumer automobile transaction where a consumer challenged the sale price of an automobile. The consumer purchased a car and signed three contemporaneous contracts: a purchase agreement, an installment sale contract (i.e., the purchase was subject to the condition that the installment contract would be accepted by a financing institution), and an arbitration agreement. The purchase agreement incorporated the arbitration agreement. The arbitration agreement incorporated the installment contract. The installment contract (quite confusingly, in my opinion), however, did not incorporate the arbitration agreement or the purchase contract. The consumer claimed that because the installment contract did NOT incorporate the arbitration agreement, arbitration did not apply to disputes involving the installment contract. Notwithstanding, the trial court compelled arbitration. The appellate court affirmed. The general contract principle regarding construing contemporaneously executed documents together has been reiterated in many cases. See, e.g., Dodge City, 693 So. 2d at 1035; Phoenix Motor Co., 144 So. 3d at 696 (quoting Collins, 641 So. 2d at 459). “But if the parties execute ‘two separate contracts and only one contract contains an arbitration clause, the parties cannot be compelled to arbitrate disputes arising from the contract that does not call for arbitration.’ ” Phoenix Motor Co., 144 So. 3d at 696 (quoting Lee v. All Fla. Constr. Co., 662 So. 2d 365, 366 (Fla. 3d DCA 1995)). The exception is where the contract with the arbitration clause incorporates by reference the contract which does not contain an arbitration clause, such that the latter could be “interpreted as part of the [former] contract.” Id. at 697 (citing Affinity Internet, Inc. v. Consol. Credit Counseling Servs., Inc., 920 So. 2d 1286, 1288-89 (Fla. 4th DCA 2006)). Here, there was no dispute regarding the contemporaneous execution of the contracts. The appellate court found that while the installment contract did not incorporate the arbitration provision, this contract was a condition precedent to the purchase agreement. Thus, once the installment contract was accepted by a financing institution, the purchase agreement with the arbitration provision became the operative contract without any conditions precedent. (The case actually has a more complicated legal analysis to affirm the trial court’s ruling that the parties should be compelled to arbitration). In my opinion, this is nothing more than a basis to compel the parties to arbitrate when the installment contract that was sued upon did not contain an arbitration provision or incorporate the arbitration agreement or purchase agreement. All of this could have been avoided had specificity occurred in the installment contract or had the purchase agreement specifically incorporated the installment contract. But, if arbitration is a creature of contract, and the dealership prepared (which it did) the contracts it wanted the consumer to contemporaneously execute, compelling the parties to arbitrate based on what is perceived to be the “operative contract” seems to go against the grain that parties cannot be compelled to arbitrate disputes arising from a contract that does not contain an arbitration provision. This entry was posted in Arbitration and tagged arbitration, arbitration provision, contemporaneously executed contracts by David Adelstein. Bookmark the permalink.